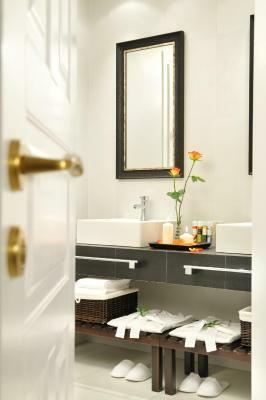 Lock in a great price for Melian Boutique Hotel & Spa – rated 9.3 by recent guests! This is a MUST in Pollonia! !We could not have been happier or asked for more with our stay. 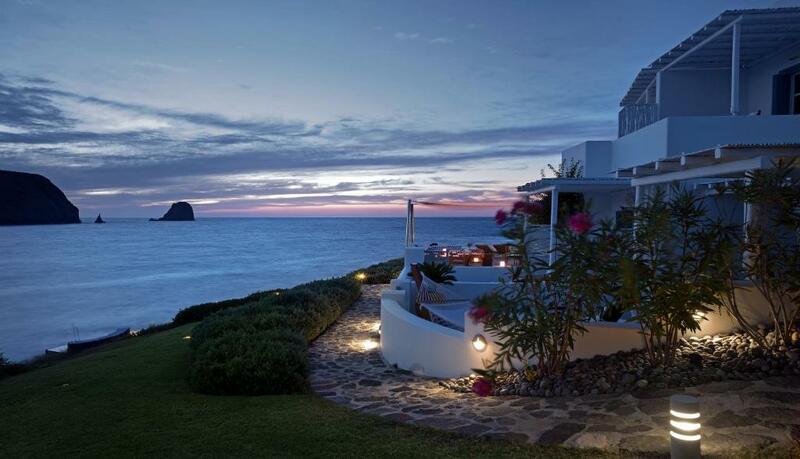 From the breathtaking views from the whole property, and our private ocean view balcony. Our experience here was remarkable. This boutique hotel and staff will stay in our hearts forever. 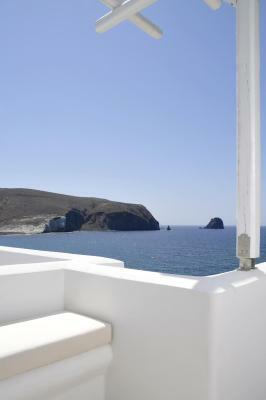 And Milos is a must see island! Hotel location was very romantic, we watched the sunset and the star constellations every night from our balcony. There is a private beach and a small communal plunge pool. The food and drinks were delicious and I recommend getting a massage from the hotel spa! The bed was comfortable and the bathroom spacious. Loved having a pull-out drying rack for our wet swimsuits on the balcony. The staff was very helpful and amazingly friendly. We also made a few cat friends that made our trip memorable! Stayed for a night in September. The location of the hotel is truly amazing!!! so close to the sea! Sleeping quality and breakfast are perfect. The facilities are immaculate and the staff very professional and direct. Einfach Hammer! Wunderschöne Lage etwas ausserhalb Pollonia. Ca. 3 Minuten bis zum Strandabschnitt und einigen sehr netten Tavernen am Wasser. Die Lage der Terrasse in welcher man das reichhaltige Frühstück, Snacks, zu Mittag und Abendessen oder auch nur einen Drink einnehmen kann, lässt keine Wünsche übrig. Das Personal war äussert zuvorkommend, aufmerksam, freundlich und hilfsbereit. Es viel uns schwer von hier wegzugehen. Wir kommen bestimmt wieder. Nous avons particulièrement apprécié le service sur mesure offert par l'établissement, le personnel toujours disponible, efficace et souriant, la beauté de la vue donnant sur la mer de notre chambre et le calme qui règne dans l'établissement. 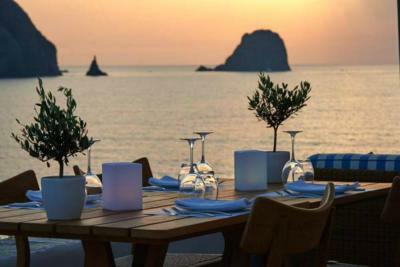 Located in Pollonia, Melian Boutique Hotel & Spa offers elegant waterfront accommodations with unobstructed views of the bay. The 15 luxurious rooms and sea-view suites combine traditional handmade furniture and objects of art with modern amenities. 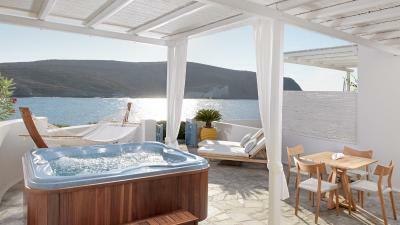 Most suites feature a hot tub in their outdoor areas. 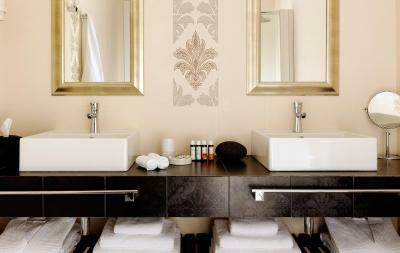 All rooms have a private bathroom with Korres toiletries, while certain rooms also feature a terrace. 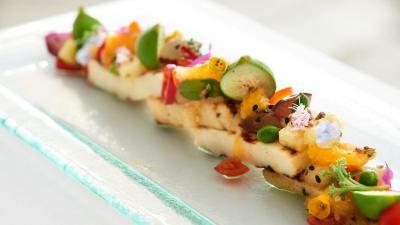 Guests can enjoy some of Melian Boutique Hotel & Spa's signature cocktails or taste refined Mediterranean dishes prepared by the property's chef. 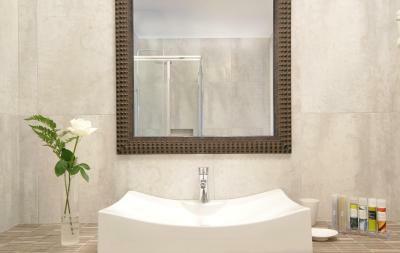 A spa is also available on site, for those looking to rejuvenate body and spirit. 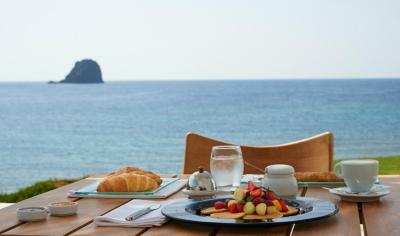 Guests at the property can also enjoy à la carte breakfast. 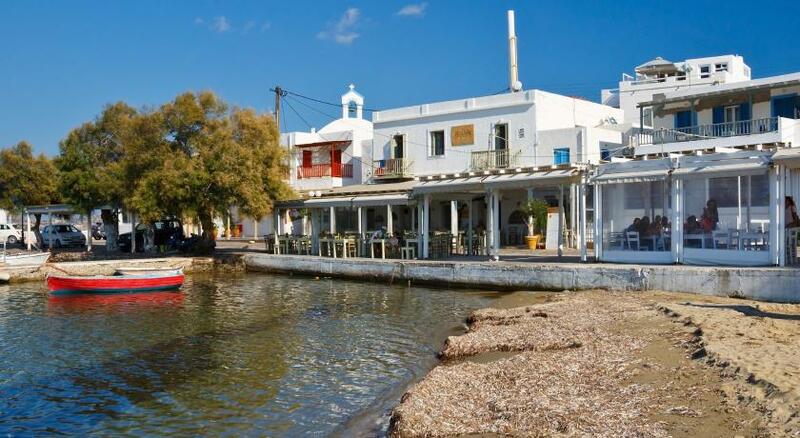 The hotel is 2.5 mi from Sarakiniko Beach, Plaka is at 7.5 mi, while Adamas Port is 6.2 mi away. 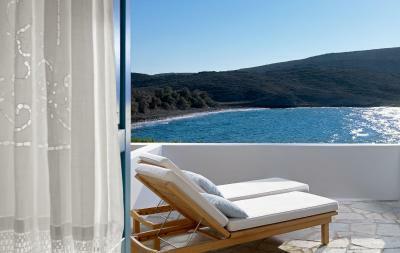 When would you like to stay at Melian Boutique Hotel & Spa? 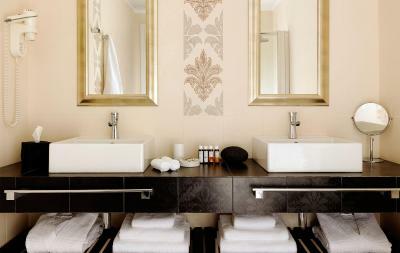 The open - plan Deluxe Suite is located on the ground floor. 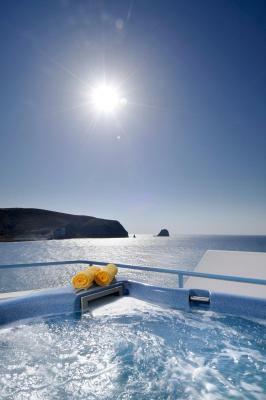 The luxurious Deluxe Suite features a spacious private terrace with a private hot tub where guests can unwind and enjoy unobstructed views of the Aegean Sea. 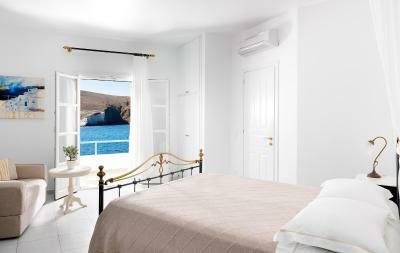 Conveniently located on the ground floor, the Junior Suite features great views of the sea. 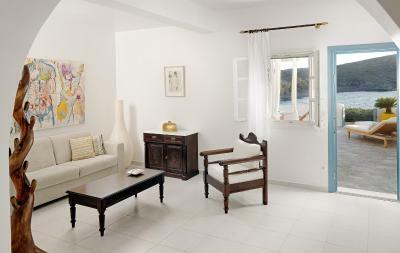 Located on the ground, first and second floors, this double room features a balcony or veranda with unobstructed views of the Aegean Sea. 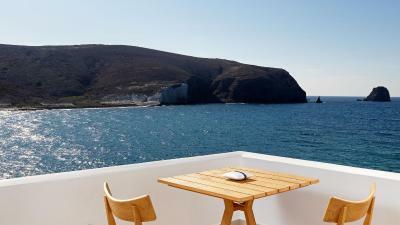 Conveniently located on the first floor, the Deluxe Double Room offers a spacious veranda with a private hot tub that enjoys unobstructed views of the Aegean Sea. Located on the first floor, this deluxe room features a private terrace with an outdoor hot tub where guests can relax while enjoying views of the sea. Located on the second floor, this superior double room features spacious indoor areas and a private terrace, enjoying panoramic views of the sea. 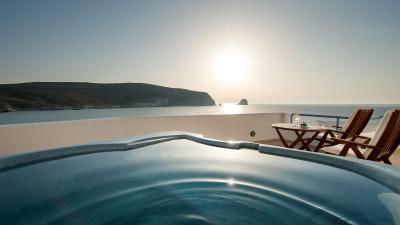 Located on the top floor, the Honeymoon Suite features panoramic views of the Aegean Sea. The room also features sun loungers and a sofa on the 46m2 terrace, while guests can relax in the private outdoor hot tub. This family room features two connected bedrooms. 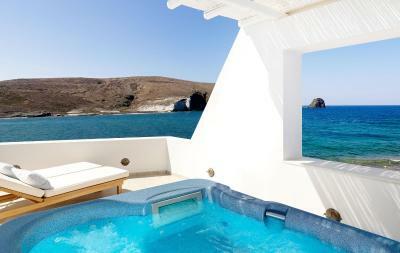 Each bedroom comes with a bathroom and a private terrace with a hot tub, overlooking the Aegean Sea. 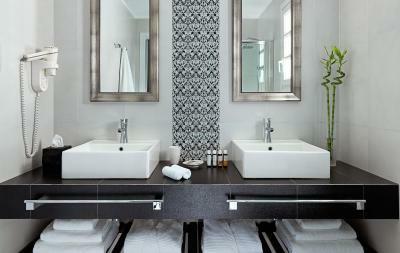 House Rules Melian Boutique Hotel & Spa takes special requests – add in the next step! Melian Boutique Hotel &amp; Spa accepts these cards and reserves the right to temporarily hold an amount prior to arrival. Melian Boutique Hotel & Spa accepts these cards and reserves the right to temporarily hold an amount prior to arrival. We didn’t want to leave , we enjoyed our last few hours until our flight on the beautiful terrace with a spectacular view of the ocean. It’s about a 15min walk to the town where the restaurants are located. It’s a pretty walk along the beach. I recommend renting a car or a scooter to get around the island. So comfortable and amazing stafff!